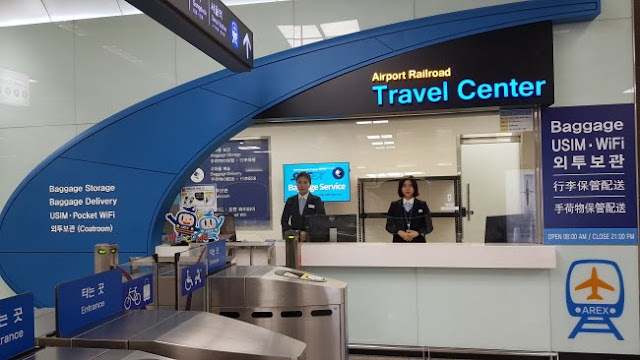 One-Stop Travel Service offering all your travel needs from transportation information, accommodation reservation, baggage storage to pocket WIFI rental opened at Travel Center in Gimpo International Airport Station. Travel Center, which opened its doors on January 1 within the Tourist Information Center at basement level of Gimpo International Airport Station, has tour managers fluent in English, Japanese and Chinese to provide tourists with various travel information. Currently, the center provides services including public transportation information, travel packages and accommodation reservation, baggage storage and delivery, overcoat storage, SIM card sale, and Pocket WIFI rental. With the center open all year round, travelers can visit whenever they need any assistance! * Assistance in languages other than English may not be available at all times depending on staff schedule.